◎ Guo Wengui began actively making sensational and largely unverifiable claims about CCP corruption on social media since January. 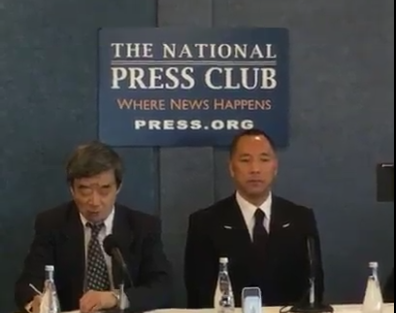 Wanted Chinese billionaire Guo Wengui’s talk at the National Press Club in Washington D.C. revolved mainly around the Chinese Communist Party’s spy network in the United States, and less about CCP elite corruption, his usual topic on Twitter. Guo claimed he had top secret documents from the CCP and when asked how he had obtained them, including those he shared at the event, Guo answered that he could obtain such documents at “any time” he wanted from CCP officials, including from officials in the Politburo Standing Committee (PSC), the highest decision-making body in China. Our take: Going by precedent, Xi Jinping could very possibly use Guo’s disclosure to purge Jiang Zemin faction members inside the PSC or weaken their influence over personnel matters. There are seven members in the present PSC, with three hailing from the Jiang faction. In a July 5 Youtube video, Guo indicated that Chongqing Party secretary and Jiang faction member Sun Zhengcai was CCP General Secretary material. He described Sun as a “once-in-a-thousand-year saint” and a “political super genius.” Sun was abruptly removed from office on July 15, formally investigated on July 24, and expelled from the CCP on Sept. 9. The big picture: Guo Wengui, an elite Chinese businessman intertwined in CCP politics and business, began actively making sensational and largely unverifiable claims about CCP corruption on social media since January. Guo’s claims have received attention in part because of the upcoming 19th Party Congress, an important personnel reshuffle that will determine China’s policies for the next half a decade. The results of the 19th Congress will be a watershed moment in the factional struggle between Xi and Jiang. The losing side faces being completely purged from the Party and imprisonment. See our Oct. 3 brief on Guo for more on his inconsistencies. Contact us for an in-depth report about Guo Wengui.